The Torah attributes significance to all of a person's daily actions and there are halachic guidelines on how a Jew should conduct himself from the time he wakes up until he goes to sleep. See a closely related topic Bedtime Shema for the halachos regarding saying Shema before going to sleep. See Respecting the sanctity of the Shul. One may not place food even if it is covered under a bed because there is a concern that ruach raah coming upon it. This applies to raw or cooked food and even water. If one already put food under a bed some poskim hold that the food may be eaten, while others say that it should be thrown out. Some say that this ruach raah only applies to food that was under a bed when someone was sleeping on it, but others disagree. There is a discussion if this concern also applies to a bed of a non-Jew. Some say that there is no concern of placing food underneath one's pillow. There is no concern of ruach raah on utensils other than food. ↑ Rashi (Bamidbar 23:24) writes that when a Jew wakes up he should wake up like a lion in order to perform mitzvot with alacrity. This idea is also found in Shulchan Aruch 1:1. Additionally, Rashi continues, before going to sleep a Jew makes sure to say Shema and entrusts their soul to Hashem. ↑ Some sources suggest that one should sleep 8 hours such as the Rambam (Deot 4:4) and Orchot Rabbeinu (1 pg 189, biography of the Steipler). Some quote Mishna Brurah 1:9 to argue that one should sleep as much as one needs. If one however carefully reads the whole sentence there, one will see that the Mishna Brurah is speaking about someone who is weak and afraid that, should they not get enough sleep it will result in them falling asleep during davening. 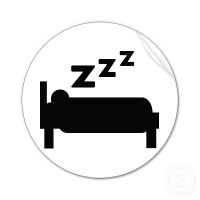 Baer Heitev 1:6 says the correct amount of sleep is a subjective measure and some people may need more than others. Yalkut Yosef (edition 5764, vol 1 pg 64) writes that it is unhealthy to sleep more than 8 or less than 6 hours. Aruch HaShulchan says that some learn from the pasuk "Yashanti Az Yanuach Li" that one should sleep 8 hours because the gematria of "Az" is 8, yet others maintain since the gematria (mispar katan) of "Li" is 4 one should sleep 4 hours, but concludes that it all depends on the health and age of the person. ↑ Kitzur Shulchan Aruch 71:2 disagrees and writes one should not sleep alone in a room. Mishna Brurah 239:9 states one should not sleep alone in a room at night. However, Shaar HaTziyun 239:17 writes when there are others in the house it can be made permissible by leaving the door ajar. Yalkut Yosef (Brachot pg 669, Sherit Yosef vol 3 pg 369) also holds that it is forbidden. He however writes if one has no other option than to sleep alone in the room, one should at least leave a light on in the room. Rav Mordechai Eliyahu (comments to Kitzur Shulchan Aruch 71:2) agrees. ↑ Shulchan Aruch OC 63:1. Shulchan Aruch Even Haezer 23:3 says that it is prohibited to sleep on one's back, but leaves out the prohibition to sleep on one's stomach. Mishna Brurah 239:6 says that it is a severe prohibition to sleep on one's back or stomach and one should sleep on one's side. Shalmat Chaim 224 states that the correct position to sleep in should be reinforced with children at the age of nine. ↑ Shulchan Aruch 3:6 writes that one should arrange one's bed so that one's feet are towards the south and head towards the north. However, Kaf HaChaim 3:16 cites the opinion of the zohar that one's feet should be in the west direction and head towards the east. Kaf HaChaim sides with the opinion of the zohar though he adds that either opinion is acceptable. Similarly, Or Letzion (vol 2 chap 1:1) writes that one may place one's bed in any direction but it is preferable to follow the zohar. Moreshet.co.il cites Rav Mordechai Eliyahu in Darkei Tahara as accepting both views. ykr.org also favors the opinion of the zohar. ↑ S”A 4:16 writes that a person should not sleep more than Shitin Nishmei. The Rama limits this stringency to the daytime. Halachically Speaking (vol 3, article 1, pg 4) writes that there are some lenient opinions about sleeping during the day but the general consensus is that one should not sleep during the day unless one needs to do so to serve Hashem more effectively. Beiur Halacha 4:16 s.v. David quotes three opinions on the length of Shitin Nishmei; some say it is more than 3 minutes, some say a half hour, and some say 3 hours. Mishna Brurah 4:36 concludes with a quote from the Machasit HaShekel that sleeping during the day depends on each person’s individual needs to be able to serve Hashem in the most effective way possible. (The Beiur Halacha 4:16 s.v. David reaches a similar conclusion). Piskei Teshuvot 231:1 writes that the Halacha follows the opinion that Shitin Nishmei is slightly longer than a half hour. ↑ S”A 4:15 writes that there is a doubt whether one who sleeps during the day should wash their hands with a bracha or not and so the Rama concludes that one should wash without a bracha. Mishna Brurah 4:34 writes that this only applies if one sleeps more than Shitin Nishmei. ↑ Pitchei Teshuva 116:4 citing the Shvut Yakov 2:105 writes that after the fact if the food was under the bed it is still permissible to eat it. However, the Binat Adam 63 quotes the Gra as holding that one should throw away the food. Rav Ovadia Yosef in Yabia Omer YD 1:9 concludes that if there's a large loss the food doesn't have to be thrown out and if no one slept on the bed when the food was there it is permitted after the fact even if it isn't a large loss. ↑ Torat Chaim Bava Batra 58b writes that the ruach raah is a result of the tumah that descends upon a person who is sleeping, which is akin to death, and transfers to anything under him. However, the Darkei Teshuva 116:38 quotes the Or Yitzchak 14 who writes that this applies even to food under a bed that no one slept in. See Pri Hasadeh 5. ↑ The Darkei Teshuva 116:39 cites a discussion about food under a bed of a non-Jew. The Degel Efraim 28 holds that there is ruach raah. The Teshurat Shay 2:116 writes that there's no concern of ruach raah under a bed of a non-Jew. ↑ Darkei Teshuva 116:37 quotes the Mizmor Ldovid who holds that there's no concern of ruach raah under one's pillow. This page was last edited on 12 March 2019, at 23:09.